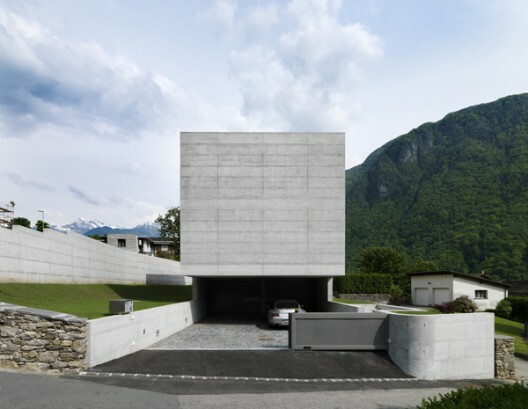 Located in the Swiss Alpine village of Lumino, just north of Bellinzona, this house stands as a monolithic element, quietly complementing and echoing its context. The surrounding area is characterised by traditional stone built houses, many of which date back centuries and are marked by their use of this single construction material. 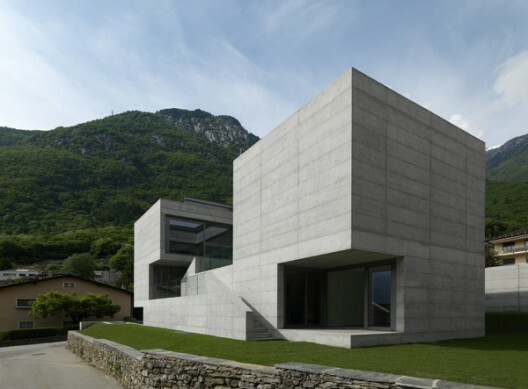 The new house is intended as a relevant response to and contemporary interpretation of the vernacular; its exposed reinforced concrete form recalls the revered strength and resonates the presence of these old stone houses. Sitting on the edge of the old village, the house acts as a sort of bastion between the old core and the modern residential expansion. In addition to the local scale references and material cues siphoned from the physical context, the concept and approach to the project was further influenced by the clients' expressed desire for a minimalist aesthetic, both internally and externally. As such, the quality of the spaces in the house would be defined explicitly by the architecture and not by objects placed within it. The idea of the 'minimalist monolith' was adopted as the conceptual generator of the project and became a principle applied to all elements of the both the functional and construction programme, from the foundations up to the smallest finishing details. The geometry of the plan is generated by two shifted parallelepipeds and follows the fall of the site. The typology created by this staggered geometry underlies both the peculiarities of the landscape while also offering each of the levels a direct relationship with the surrounding gardens. 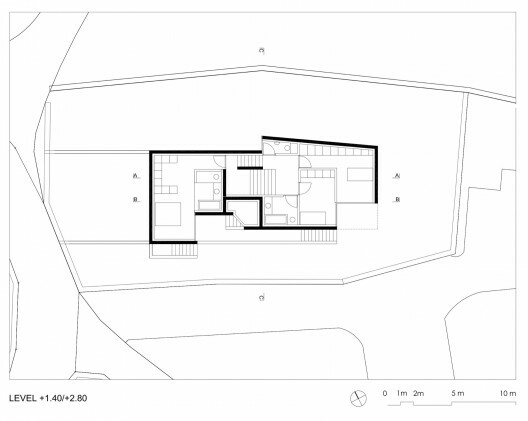 The double system of vertical connections, one internal and one external, relates all the spaces of the house in a spiral movement and is in a constant play with its new inhabitants' perception of time and scale. 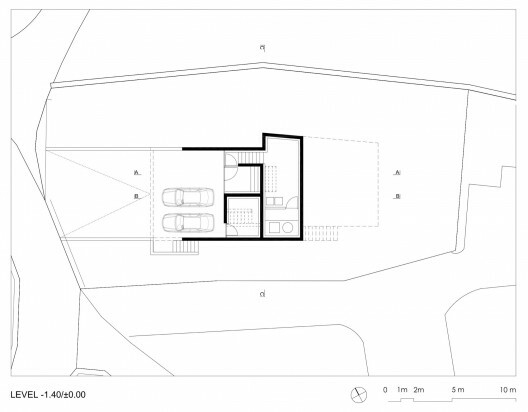 What is interesting about the house is the ability of the spaces to expand and extend into the landscape, allowing the external become part of the composition. While the individual spaces may be defined geometrically, each space flows into the next and continues to the external. The principle of the house is to protect and guarantee an intimacy and privacy for its inhabitants but also, somewhat paradoxically, to represent an air of generosity and an opening up of to the world. The intention is to create places in which residents are open and connected to the wider community in a concrete way, beyond the filter of maddening virtual communication. This physical relationship with the community restores a healthy balance of mind and aptitude. Excavations into the ground rock were kept to a minimum, with only the service spaces placed underground (-1.4m). Vehicle and pedestrian access is from street level (+0.0m). 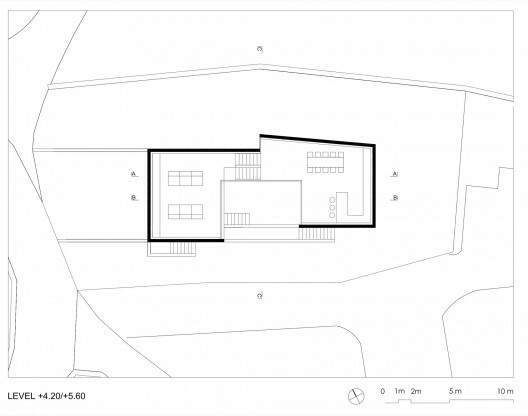 Half a level up from the entrance hall are two bedrooms, both with direct access onto a terrace(+1.4m). On the next floor (+2.8m) is the master suite, again with its own terrace and access to the garden below. 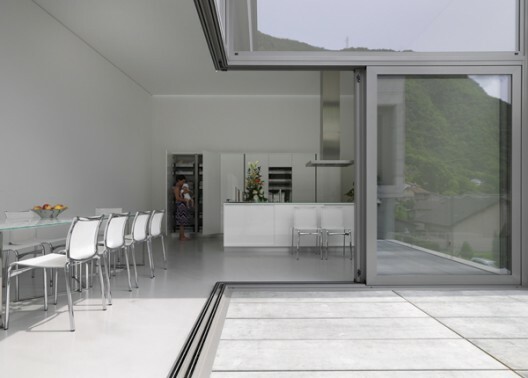 Continuing up the house, we arrive into the dining and kitchen space which opens onto the central south facing loggia (+4.2m), with access to the terraces below. This central loggia, which affords panoramic views over the surrounding rooftops, may also be covered with a hydraulic roof when required. The living space on the top floor overlooks and has access down to the loggia below. Along with gains from the inherent thermal values of concrete, the house's sustainable credentials also benefit from a heat pump and photovoltaic cells placed on the roof.